"... by standing in front of the church of [San Benedetto (18th century)] and looking at it from below, the visitor will immediately realise that he has reached one of Cortona’s loveliest spots. The grace of the elliptically designed church, along with its raised position above the square below and the magnificent view over the bell tower of Sant'Agostino, as well as the terracings and ramps that lead up to the church entrance – all is of exquisite design…All combines to create an atmosphere of such enchantment that even the most distracted tourist will be bewitched." (A.Tafi, "Immagine di Cortona", 1989). 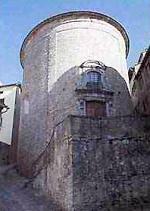 Built originally in the 14th century on the foundations of an Etruscan tower, the church of San Benedetto passed into the hands of the Congregazione dei Preti del Sacramento in 1422, then under the control of the Confraternita di S. Giovanni in 1552 and a succession of other religious orders and brotherhoods until 1945 when it was granted to the Piccola Opera della Divina Provvidenza di D. Orione. The original church was entirely rebuilt in 1722 by the Scolopi Fathers, who changed the original rectangular design into its current oval shape. In the 18th century the Florentine painter Taddeo Mazzi decorated the interior with frescoes of the Madonna and St Joseph. The high altar, which is dedicated to St Francis, is dominated by a statue of Christ bound to a column. The arch-shaped canvas depicting ‘St Anne Appearing to St Francis of Sales and St Benedict’, by Francesco Conti (1682-1760), was probably part of the decoration of this church and moved when the Scolopi Fathers left this church for Sant'Agostino. This canvas is quoted by Sernini Cucciatti and is listed as being one of the finest works to adorn any church in Cortona, in: Quadri in chiese e luoghi pii di Cortona alla metà del Settecento, ed. Cortona 1982, edited by P.J.Cardile, p.24).